This Civil War-era lithograph, circulated in the North, lampoons the idea that the Confederate Army was composed of southern "volunteers." A conscript is compelled by force to fight for "King Cotton," despite his protests that he is a "Union man." In reality, both the Union and Confederate Armies relied on conscription to fill their ranks, and in both cases men from the poorest classes were the most directly affected, while the wealthy were offered exemptions from service. 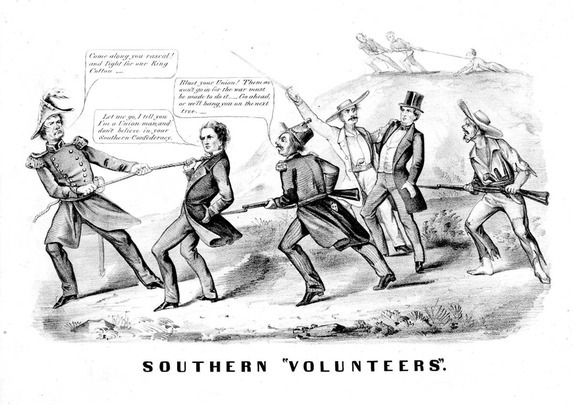 Despite the aristocratic dress of the conscripts in the cartoon, it was poor southern whites (especially those from the mountain regions of southern states, where plantation farming was virtually nonexistent) who were most likely to be resentful of conscription and most likely to support the Union. Source | "Southern 'Volunteers'," New York [? ], Currier and Ives, circa 1862, Prints and Photographs Division, Library of Congress, http://hdl.loc.gov/loc.pnp/cph.3a12086. Cite This document | Unknown, “"Southern 'Volunteers'",” HERB: Resources for Teachers, accessed April 23, 2019, https://herb.ashp.cuny.edu/items/show/645.